Brian Jao, MD, Garrick Gu, BA, Robert Slamin, BS, Aparajit Naram, MD, Angel Baez, BS, Danielle Stamer, BS, Janice Lalikos, MD. University of Massachusetts, Worcester, MA, USA. BACKGROUND: Postoperative pain can be a challenging problem, compounded by the risk of narcotic abuse. There remains significant inter-prescriber variability, worsened by the lack of standards for postoperative pain management. The outpatient setting is difficult as surgeons are limited to oral medications and a short window to titrate each patient's pain regimen. 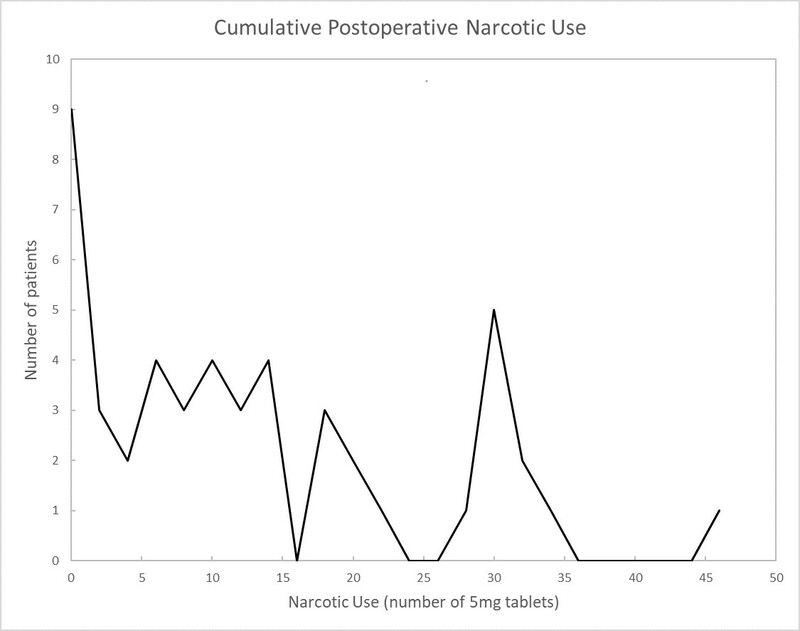 The aim of this study is to compare self-reported medication use with pre-and post-operative surveys of patient's experiences, expectations, and pain levels to determine identifiable risk factors and habits that may predict increased narcotic use.METHODS: All patients (n=49) underwent single site, day surgery within the University of Massachusetts Plastic Surgery department. Patients with self-reported active opioid dependence were excluded. Procedures performed were breast augmentation (n=11), reduction mammoplasty (n=30), abdominoplasty (n=4), gynecomastia (n=1), and carpal tunnel release (n=3). Preoperatively, enrolled patients quantified their anticipated pain on a visual analog scale and prior exposure to narcotic medication. Postoperatively, patients recorded the number of 5mg tablets used daily for a 21-day period in addition to their daily average pain level and their methods of alternative pain control. Oxycodone or hydrocodone were prescribed at the surgeon's discretion. On analysis, patients were separated into high and low use groups based on their place in an observed bimodal distribution of narcotic consumption. RESULTS: The data collection represents a preliminary analysis with 1/3 of intended study population. On average, patients used 13.6±3.6 tablets in the 3-week postoperative period. Although the patient reported preoperative anticipation of pain was identical for the day after surgery, the high use group reported significantly higher anticipated pain for days 3, 7, and 21 (p=0.026, 0.075, 0.21) after surgery. This trend tracked with postoperative pain scores, as daily pain recorded by the high use group rose and remained significantly higher for days 3, 7, and 21 (p=9.68e-05, 0.0041, 0.00031). The high use group required additional prescriptions (p=0.016) and were less likely to be concerned about developing a narcotic dependence. CONCLUSIONS: This study demonstrates a bimodal distribution of narcotic use which has been seen in previous studies. When compared with the low narcotic segment of this distribution, the preoperative survey identified that the high narcotic users had a much greater preoperative anticipation of pain. This correlated with a slower return to baseline pains scores postoperatively. The high use group additionally demonstrated concerning habits such as multiple prescriptions and low utilization of alternative pain control options.